The only Arduino designed for healing (probably not). Okay, but it is designed for teaching. 3.3 300mA LDO with an enable pin. Despite what one page says, the "enable pull-down resistor" disables the regulator. It's the brain. So many brains. The AddOhms YouTube channel features this board in a three-part series. It shows how to design a DIY, or standalone, Arduino board. Learn how to draw the schematic, layout the PCB, and finally turn-on the finished board. Originally, the board was a boring rectangle. Then I remembered an old trick to giving presentations: "Draw a triangle on the board." You'd be surprised how often it works. In this case, I made some cool boards and an entire video series out of the strange tip. What problem does the Pyramiduino solve? Um. I'll get back to you on that. Functionally, it is similar to a 328p-based Arduino Pro Mini. Except the Pryamiduino has a 16 MHz crystal. On the other hand, it is like an Uno/Nano without the USB chip and a 5 volt regulator. The headers break out the same I/O pins as an Uno. The serial pins accept the common "FTDI board" form factor for easy UART access. There is no ICSP header, but all of the necessary signals are necessary for in-circuit programming. The board only operates on 5 volts. There is an onboard 3.3 volt LDO. The design files included on this project are the "correct" files. Aka, they do not include the mistakes from the video series. Mistakes which were entirely there for educational video reasons. You will need to get the board manufactured. 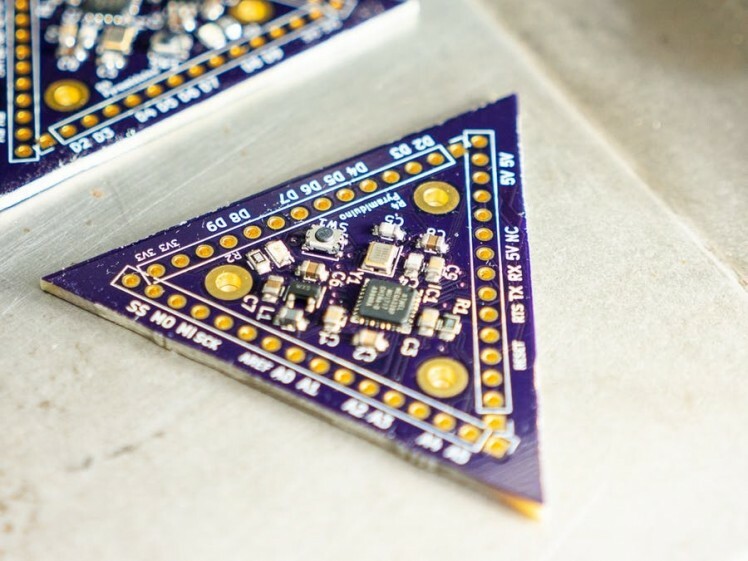 You can order the Pyramiduino PCB from OSHPark. Assembly is best done with a reflow oven or hot plate. The 328p used is a QFN (or MFN) package. It is very difficult to solder by hand, but not impossible. As shown in the video, part 3, you need an AVR ISP to load the bootloader. If you don't have a standalone programmer, you can try using an Arduino as an ISP. As I show in the Turn-On video, it is critical to test VCC-GND and 3v3-GND to make sure there are no shorts. Bonus, episode 3 explains how the "Arduino Auto-Reset Works." KiCad 5 Schematic and PCB with "final" design. Part numbers with reference designators. I did not specify part numbers for the headers or LED. This code cycles through analog or digital pins, turning them on and off one at a time. Originally written with direct port manipulation, but slower sample rate logic analyzers will miss some edges. Fan of making things blink, beep, and fly. Creator of AddOhms and writer at baldengineer.com.